Mechanically self-sufficient devices such as safety valves, relief valves and pressure reducing or expansion valves. Electromechanical technology in the form of pressure switches and electro-valves. ETNA Industrie fluid regulators operate in a pressure range from negative (-40 mb) to as high as 400 bar. Below is a description of types of equipment and their main features. These regulation devices are actuated solely by the mechanics of the fluids whose circulation they control. By design they respond to set ranges of pressure or flow-rate. They operate by opening whenever pressures or flow-rates exceed or fail to reach a given set point. Devices such as these reset automatically to ensure leak-tightness on re-closure. ETNA Industrie products are distinctive in that they are designed by so-called “indirect” technology. This will be described in greater detail in a forthcoming article. Below is a description of the key features of the main families of industrial fluid regulators. These valves operate under pressure of the liquid or gas contained in a circuit, whose force opens the valve on reaching a critical, preset pressure, i.e. before excess pressure might rupture or otherwise damage the circuit or system in question. A safety valve is specifically designed to reclose automatically and prevent further release of the liquid or gas contained in the system as soon as pressure falls back to service values (cf. ISO 4126-1). ETNA Industrie brings to market an extensive range of safety valves suited to various industrial applications. For example, to meet extreme environmental conditions at water depths of 3000m, ETNA Industrie has miniaturized a highly sensitive low pressure regulator (operating at less than 2 bar). At the other end of the pressure range, namely above 150 bar, ETNA Industrie relies on a number of detection technologies developed over its 75 year history, such as pistons or bellow devices to enhance both operational precision and service life. Solutions may be individually designed to meet customer detailed specifications. Our valves operate at standard temperatures ranging from -30°C to +130°C and are designed regulate industrial fluids of many kinds (air, natural water, pure water, oil, nitrogen, SF6, helium,…). Fluid regulation also requires devices to reduce and stabilise pressures at circuit extremities and ensure set-points are met, no matter what pressures or flow rates are encountered upstream in the system. ETNA Industrie’s fluid regulation devices reduce pressures by ratios as high as 1:20 (and on occasion higher), both for compressible and incompressible fluids, at pressures ranging from 100 mbar to 300 bar. Depending on the technology (diaphragm or piston), pressures prior to reduction can be as high as 250 to 350 bar. ETNA Industrie’s pressure reducing valves are designed to prevent fluid backflow from higher pressure circuits downstream and are fully leak-tight on closure. Standard valves in the ETNA Industrie range are designed for service temperatures of between -30°C and +130°C and are specifically suited to regulating numerous industrial fluids (air, natural water, pure water, oil, nitrogen, SF6, helium,…). ETNA Industrie designs and markets complete hydraulic systems incorporating fluid regulation systems that are electrically controlled or transmit electric signals. Examples are shown below. A pressure switch is a form of sensor transmitting an electrical signal when pressure reaches a set point. The electrical signal actuates devices controlling fluid statics or dynamics to ensure pressure regulation in target systems. ETNA Industrie’s proprietary pressure switches regulate (among others) oil pressure in circuit-breaker control systems and are used in conjunction with pressure-sensitive plates. Pressure switches may be designed with capability to react to several pressure set points. ETNA Industrie pressure switches operate from as low as a few millibars to as high as 700 bars and are actuated by electrical signals transmitted at 24, 48, 110 and 220 V.
ETNA Industrie service temperatures range from -20°C to +110°C and our valves are designed to regulate numerous industrial fluids (air, natural water, pure water, oil, nitrogen, SF6, helium,…). Electro-valve opening or closing in a fluid regulation system is electrically tripped. The electro-valve normally stays open in the absence of current, but may be designed as a stop-valve opening on reception of the electrical impulse. ETNA Industrie electro-valves are “on-off” and feature a magnetic actuator out of contact with the fluid regulated. 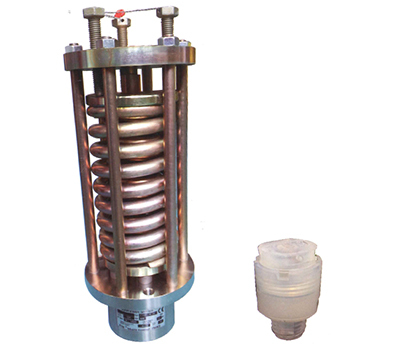 The electro-valve closes by force of a spring released when current is cut to the solenoid, thereby creating an autoclave effect to ensure system leak-tightness. ETNA Industrie’s proprietary electro-valves control (among others) oil pressure in circuit-breaker control systems and are used in conjunction with pressure-sensitive plates. ETNA Industrie electro-valves handle pressures from as low as a few millibars to as high as 700 bars. They are actuated by electrical signals transmitted at 24V, 48V, 110V and 220V. ETNA Industrie is a specialist designer and manufacturer of an extensive and fully-listed range of fluid regulation systems, select examples of which are briefly described above. For further information, our Sales Department will be pleased to assist. Contact us on: commercial@etna-industrie.fr. This entry was posted in Product and tagged Electro-valves, Fluid regulation, Pressure reducers, Pressure switches, Safety valves on 15 May 2017 by Sandrine Selvaradjou.